You know how a certain smell will completely comfort you and take you back to a warm memory? One of those smells for me is corn tortillas frying in oil, preferably corn oil. As soon as I sense it, it's like I'm covered in a fuzzy blanket. 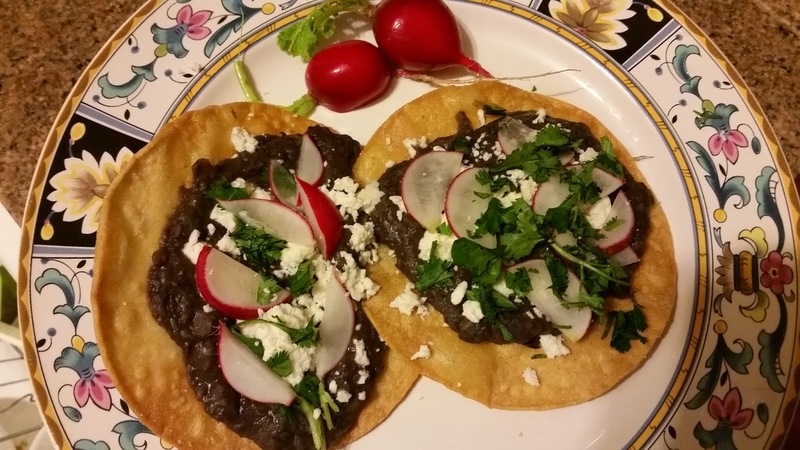 This recipe will make 8-10 regular size tostadas or maybe 12-14 small ones. I'll add a recipe card soon, but the mouse on my laptop is buggy right now! At some point in the 50s, my Pennsylvania and Illinois-born grandparents all packed up their kids and moved to Phoenix - apparently this was common medical advice for heart conditions and allergies and who knows what else. They all loved Arizona, though, and thus began a passion for Mexican food that runs deep in my family. My grandma's neighbors taught her to make several dishes that are now family traditions. This came in handy by the time I was born in Philadelphia, where there were no good Mexican restaurants at the time. Last summer I shared some of these dishes with friends, leaving out tostada "shells", refried beans, guacamole and pico de gallo for my friends to assemble. I came back from frying tacos in the kitchen to find that most had instead treated the bowls of toppings as dips and the tostadas as some kind of giant chips to be broken up. Sweet as they are, they didn't even complain that I had mostly chips and dips for dinner. Next time, I'll remember to be more specific! We didn't use black beans or the other toppings in this recipe when I was growing up, but they've become a favorite combination of mine. 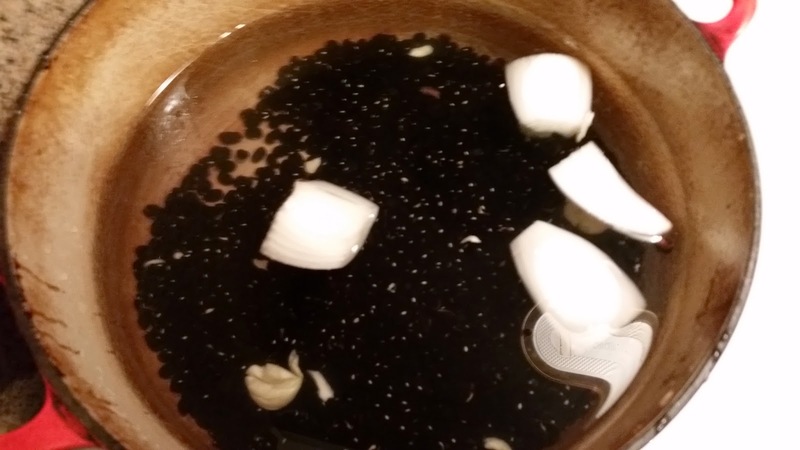 For simplicity's sake you could use two cans of black beans, drained and rinsed well, and about 1/2 c broth in place of the 4 cups beans and liquid below. Jump to the cutting board pic! This morning I was able to hang out at home, cleaning and watching TV, so I was able to let the beans simmer away at a leisurely pace. 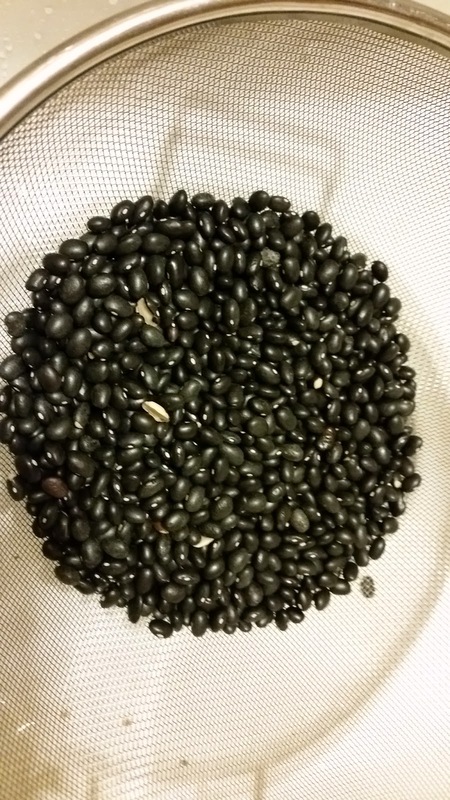 Rinse and pick through 1 lb dried black beans, removing any weird stuff you find or beans that don't look like the others. I don't usually find things in bags of beans anymore, but I used to find dirt, rocks, and other random beans or grains hiding in there. 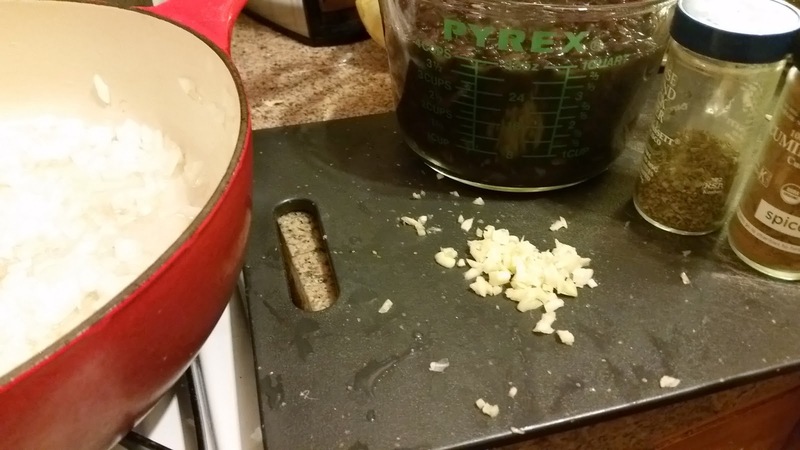 Put the beans in a large pot with 1/2 a large onion and 4 cloves peeled garlic. Cover with 2-3 inches of water. If any beans float up with the onions at this point, they're too dried out. Scoop them up and throw them out. Bring to a boil, reduce to a simmer and cover the pot. Cook for about 2 hours, checking every 30 minutes or so to make sure there's enough water. Give a stir each time because beans can scorch on the bottom even if there's liquid on the top. When the beans are about 15 minutes from done, stir 1/2 to 1 tsp salt into the pot. When finished, remove from the heat and set aside if using within a few hours, refrigerate if using the next day. Measure 4 cups of the beans, including some of the cooking liquid. Chop the other 1/2 of the large onion and mince 4 more cloves of garlic. Put the rest of the beans in the fridge or freezer in their liquid. You'll also need a teaspoon each of cumin and Mexican oregano (or regular oregano if that's what you've got). Or chili powder if you prefer. Make it how you like it. 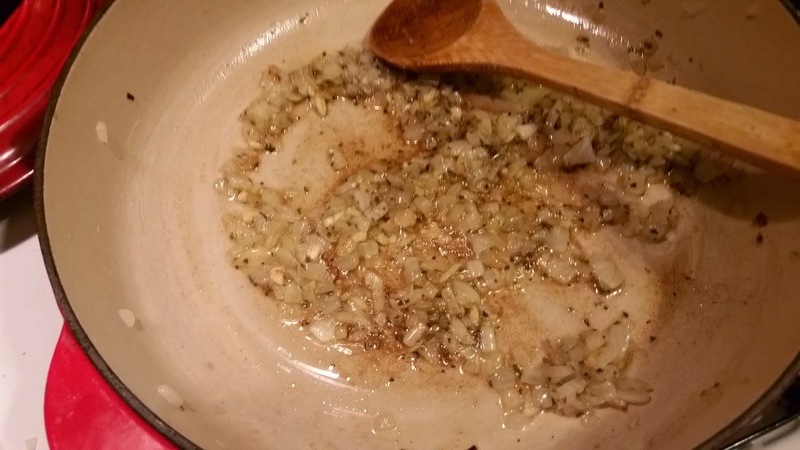 Saute the onions over medium heat in 2 Tbsp vegetable oil until soft, about 5 minutes. Be careful not to brown them. No biggie if a few pieces start to brown, but start again if a quarter or more of them do. Push the onions to the side and add the garlic to one side of the pan. Saute just until fragrant and then mix those in with the onions. Do the same with the oregano and cumin that you did with the garlic. This will "wake up" the sleeping beauties that are dried spices and make them really flavorful. Just cook another minute. Add the 4 c beans and liquid to the pot and heat through. Check to see it has enough salt, add a little fresh black pepper, then roughly puree them with a potato masher or a stick blender. Keep stirring and add more liquid or oil if it starts to dry out or stick to the bottom. Turn off the heat for now. If you're frying the tostadas, click here for directions and get the oil ready. 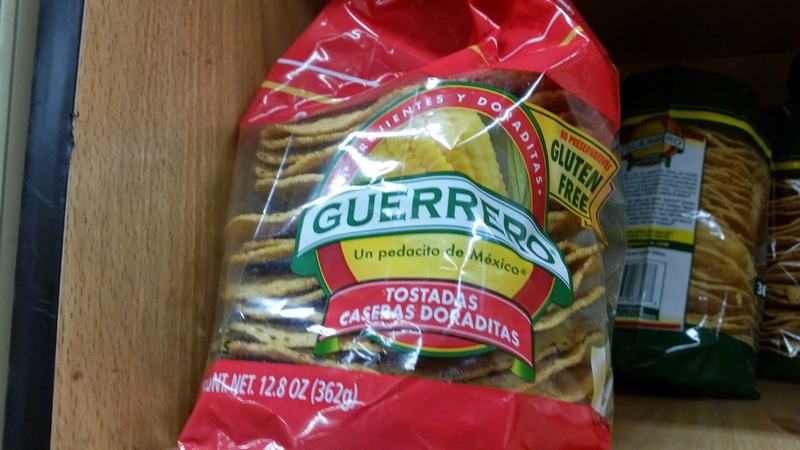 You can also buy pre-made tostadas at many supermarkets or Mexican markets, next to the tortillas. They come in a stack in a bag like this. When the tostadas are ready, prepare the other toppings. 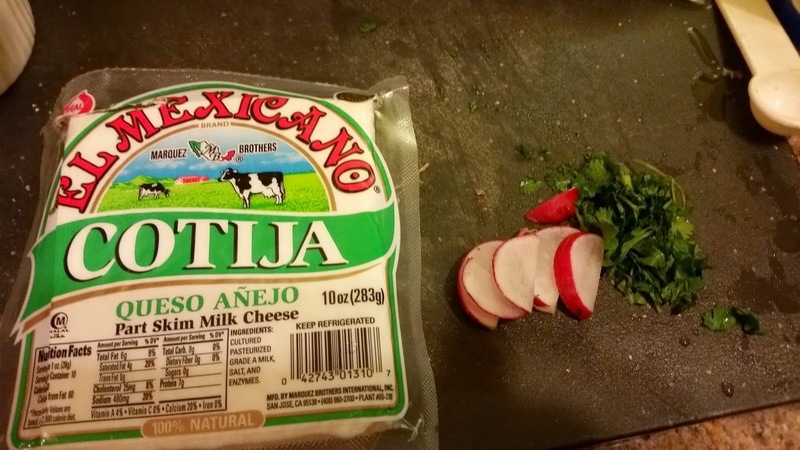 Crumble about 4-5 oz cotija cheese - this is a dry salty cheese kind of like feta, which you could use if you can't find cotija. Slice up 6-8 radishes and chop up 1/4-1/2 c cilantro leaves. Slice an avocado into 16-20 pieces. I forgot to photograph the avocado. Oops! If you'd rather use lettuce, tomatoes, and Monterey jack instead of these toppings, that's OK too. Gently re-heat the beans if they've cooled and spoon them onto the tostadas. 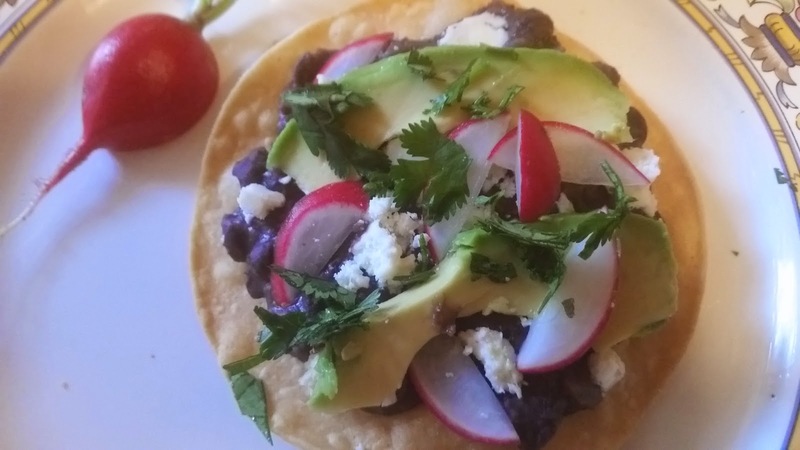 Top each with about a tablespoon of cotija, 2 slices avocado, 6 or so slices of radish and as much cilantro as tickles your fancy. Shake your favorite hot sauce on top - a chipotle one would be really good here!